Actually, this is their tourism board. The main story finds the Doctor, Sharon, and K-9 in China, 1522, as the countryside is being raided by Japanese pirates. 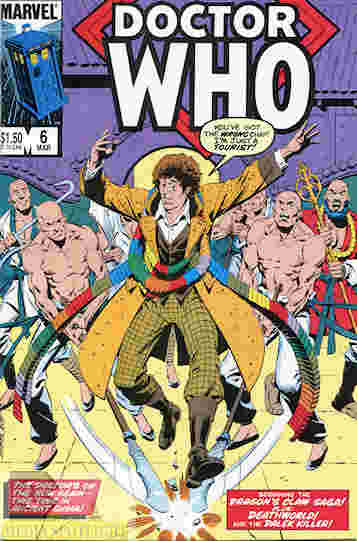 A group of Shaolin monks have taken up swords to fight them, but one of them has a laser, and when the TARDIS crew arrives they investigate. The abbot, Yueh Kuang (also the one with the “star weapon”) has them taken out of curiosity due to how his cohort, Li, sees them arrive. They’re taken to their monastery, where they learn the style of the Eighteen Bronze Men, a style Kuang brought with him and used to overthrow the previous abbot, Hsang The Ancient. The Doctor and Sharon manage to get past their guard, a novice named Chang they befriended, and speak to the Ancient. Li follows but Hsang manages to knock him out and the two manage to return to camp. But when the Doctor sees Li talking to Kuang, he makes a run for the hall where the style is taught. There he learns who the Bronze Men are…Sontarans! What they got right: I think this is the first “period story” we’ve gotten in the reprint comics and it’s a good one. It’s a good mystery, with the reveal a nice cliffhanger for the reprints. We also get to see the Sonic Screwdriver in action. And Marvel’s coloring at the time fits the art better than the more modern coloring IDW employed. What they got wrong: I can’t judge it historically so I’m going to guess it’s as accurate as the story will allow. The panel where Hsang knocks out Li with a touch looked more like he was zapping the jerk in the neck with a beam from his finger. Now for the back-up stories. The first one is a full story while the second continues next issue. The Ice Warriors find a planet loaded with trisilicate, an ore they could use in their battles. However, the Cybermen had already claimed it for their empire. As the two groups fought the Ice Warriors moved the fighting to a polar region, which both sides used to defeat the other, leading to a stalemate. The story is told from the perspective of the Ice Warriors’ commander, Yinak, and it is interesting to watch two of the Doctor’s enemies fighting each other. And now for the moment I’ve been waiting for: Abslom Daak! As Earth wars with Skarro they send their most vile killers (and in UK sci-fi comics there are plenty to choose from) to a Dalek held world to either clean the place out or at least reduce the numbers before dying themselves. One such killer is Abslom Daak, a bloodthirsty psychopath of the lowest order. He’s sent to the newly-conquered planet of Mazam with nothing but his clothes, what weapons he can carry, and his signature chainsword, where he rescues the planet’s leader, Princess Taiyin. She surrendered to save her people not realizing the Daleks were going to kill them anyway. So she thinks Daak killing one just made things worse. It’s a short first part but I just really like this story. I don’t know why. Maybe because it’s a vicious murderer sent to fight Daleks? Taiyin is dressed like something out of the Flash Gordon comic strip and there is a sort of disconnect between that classic look and an anti-hero that is pretty much Flash’s opposite in every possible way. This is the kind of character I should hate because of my tastes but for some reason I really like him. His story continues next issue. Recommendation: All three stories here are really good in their own way. This is an issue worth picking up. Posted by ShadowWing Tronix on October 10, 2018 in Television Spotlight, Yesterday's Comics and tagged Abslom Daak, Cybermen, Daleks, Doctor Who, Ice Warrior, K-9, Sharon Davies, Sontaran, The Fourth Doctor. I like the “Dragon’s Claw” story because of how it ties together both Chinese history and Japanese history. “Deathworld” is also a good story because it involved both the Ice Warriors and the Cybermen in conflict with each other. In this situation, I would root for the Ice Warriors.